Deep within him, Sen. Manny Pacquiao knows his time is almost done or even past due. At age 40, everything physical about him 10 or 15 years ago is slipping. He no longer is as bouncy as he was when he made mincemeat of the likes of Marco Antonio Barrera, Oscar de la Hoya, Miguel Angel Cotto, Antonio Margarito and many other lesser mortals who succumbed to his blinding speed. He no longer overwhelms his prey with the rapid staccato of inordinate hand speed and killer haymakers. He no longer evokes fear in the man across the ring. He no longer takes anybody for a living. Instead, the greatest Filipino boxer to ever don the boxing gloves has been selective with his foes, deliberate with every step and direction he takes and is no longer coy about his will to slip out of the sports that gave him all and more he ever dreamt of as a young skinny vagabond. But he has some businesses to take care. Career-wise, he has that single loss that he wants to avenge. He wants a payback with his tormentor Floyd Mayweather Jr who schooled him over 12 rounds in the highest grossing boxing match ever that paid both boxers handsomely. Never mind the other losses in his 69-fight career. A win over Mayweather in a rematch would be his Holy Grail. But first, it has to happen. 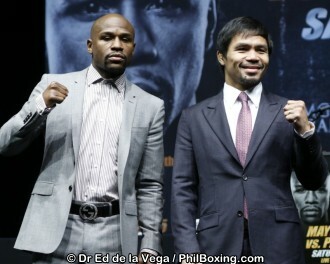 But before it happens, Pacquiao has to take of one Adrien Broner on Sunday (January 20 Philippine time). Broner, who mimics Mayweather’s fighting style albeit the slower, shorter and younger version, is a plodder of a boxer by Pacquiao’s standard. He doesn’t throw counter punches the way both Mayweather and perennial Pacquiao nemesis Juan Manuel Marquez did against the Filipino boxing icon. Broner should be an easy target as he is slow footed and does not throw many punches (an average of 39 punches per round). During his heydays, Pacquiao threw as many as 110 punches per round, his way of overwhelming his opponents. Pacquiao is coming fresh from his first stoppage victory over Lucas Matthysse in more than nine years last July in Kuala Lumpur, Malaysia where his co-promoted boxing event bombed out. If they stay true to form, Pacquiao could extend that streak again. Being 40 and still competitive and among the world’s boxing elites are hallmarks of boxing greats and Pacquiao, even if still has to hang up those gloves, is already in the their company. In fact, he could make an argument and stir a debate that he is up there among the world’s top 10 boxing greats, not just champions. But as we earlier mentioned, Pacquiao has businesses to take care. Mayweather is top on that list. And it could happen in July or later in the year. Second, somebody has to take care of his IRS issues in the US and those will require plenty of Benjamins. Third, a large payroll back home continues to drain his resources. And he still has the BIR breathing down his neck. Of course, 2022 is just three years away. The political landscape could change and he may be facing a higher calling. Boxing for another year or two will keep him relevant in many ways. But I still hope Pacquiao gets another streak going. You bet I am betting he wins on Sunday – by another stoppage. Click here to view a list of other articles written by Edwin G. Espejo.